When Gifthorse Records’ founder Bill Straw first heard Mary Black’s voice on a Los Angeles public radio station, he knew that he was hearing something special. "I spun around and turned the radio up. When I heard her I knew I had to get that album. We had it by that night and I listened to it and immediately got right on the phone to Ireland." This reaction is not uncommon. 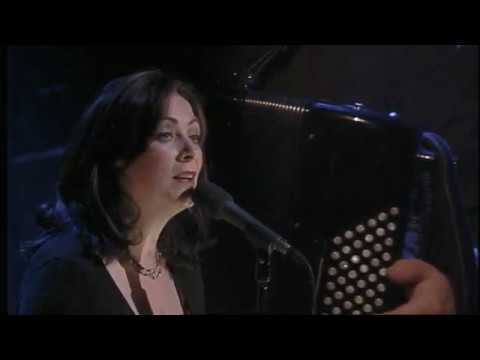 Mary Black’s voice has been described as ‘a voice to die for’ and ‘simply spellbinding’. It is hard to put a finger on what sets her apart from the plethora of exquisite Irish singers. Her voice is powerful, warm and expressive, however there is a pure, crystalline quality to it that is so distinctive it stops people in their tracks. Don’t presume for one moment though that Mary Black is simply a musical mouthpiece. She is one of those rare talents who crosses musical boundaries effortlessly and makes every song she performs her own. Her ability to interpret both folk and contemporary material has had an enormous impact on the Irish music scene and earned her major international recognition and a swag of awards including ‘Best Irish Entertainer’ and ‘Ireland’s best female artist’ for two years running. Her 1989 album ‘No Frontiers’ remained in the Irish top 30 charts for over a year. "When you’ve been singing as long as I have, you’ve got to be careful not to slot into the safe ground. I still think it’s necessary to try new things. I would like to think that I bring something different to a song. I try to be true to a song and be honest and be myself. I sing it the way I feel it and the way I’m moved by it and that becomes distinctive although I’m not setting out to be particularly different. Instrumentation and arrangements make a big different to the way songs develop after I record them. They develop and grow without you even realising. Sometimes when I listen to a recording I can’t believe how different the song sounds to what we do live." A regular visitor to Australia, this upcoming tour is going to be very different for Mary and for the audience. Her long-time musical partner Declan Sinnott left the band shortly after the last Australian tour. He had been her guitarist, producer and trusted musical collaborator almost from the very beginning. "It was a shock when Declan decided to leave although I saw it coming for a while. Looking back I think maybe it was a good thing. Changes in producers and guitar players have brought change. Bill Shanley has replaced Declan. Our drummer Dave Carly was sadly killed in a car accident and Gavin Gallagher has left. Frank Gallagher is still with me and so is Pat Crowley (piano, accordian) who has been with me for many years." Shane Howard from Goanna will be joining Mary on this tour. They have been old friends since Shane first toured with the Irish artist in 1992. When Mary recorded Shane’s song "Flesh & Blood" it went to No.5 in Ireland. "I think he’s an amazing performer. When he’s on stage there’s a magic. He toured Australia with me and then we invited him back to Ireland. I’ve recorded heaps of his songs. Two of the new songs from the album are his songs. We hope to perform together on this tour." " I would hope that the show will be different. We’ll be doing a cross section from some of the older albums and some from ‘Shine’. I don’t like to overdo new songs. I know what that can be like for audiences. This band has been touring from September to December and we’ve been recording as well. We’ve got a new album coming out in July. It’s quite different from ‘Shine’. I like to seek out change and freshness in each album. I think it is more rootsy and folky and probably closer to some of my earlier music." There is another album that, sadly for Mary Black fans, may never see the light of day. "Hidden Harvest was an album of songs that didn’t make it onto any albums but we didn’t do it. The ideas are still there but it didn’t happen. One has to be careful not to release quirky albums because people think that it’s a new album but some of it was recorded 15 years ago." Married with three children, it is testament to her passion for music and performing, as well as dogged determination that she has managed to juggle, with the help of a supportive partner, the demands of her career with the demands of her family. "I try to spread out my tours but recording is so time consuming. I leave in the morning and I don’t get home until 1am. Last night it was 2am. We’re doing an American festival tour in July and by September it will be very busy again until around December. It’s become easier for my family from a practical point of view because they’re older now and they’re busy with their own lives. My youngest still really misses me. She’s ten. I am aware of how it affects them. They’re lovely kids and they’re quite secure. My husband stays home and looks after them." There is an interview with Mary from the early ‘90’s where she says that she was proud to be Irish but looking forward to the day when she is considered an artist without the accompanying Irish tag. "I think I’ll always have the support of Irish people. They’ve always been so supportive and without them I wouldn’t have been so successful abroad but lately I’m noticing there’s a big crowd that aren’t concerned about Irishness and have heard me on the radio. Now with things like U2 and Riverdance, so many other people have opened doors and put a spotlight on Ireland. I think that the trend towards all things Irish has helped me. I’ve always lived in Ireland. Ireland has changed a lot in the last three to four years. It’s to do more with our economy. There’s been a lot of building and it’s just grown. Young people are so confident and there’s jobs for them and they don’t have to emigrate. Up until five years ago all the kids felt the need to leave because there was nothing for them to do. There’s a very positive feeling now in Ireland."